"If thou wouldst fathom me, I will devour thee," it sounded from the dark rock when two herdsmen had asked long ago how deep the gap was from whence the waters of the Meräuglquelle spring sprouted. Even then, the special power of this water was well known in the region, and many of them swore that they had received recovery from their ailments. Until today, the source of Filzmoos is very popular. 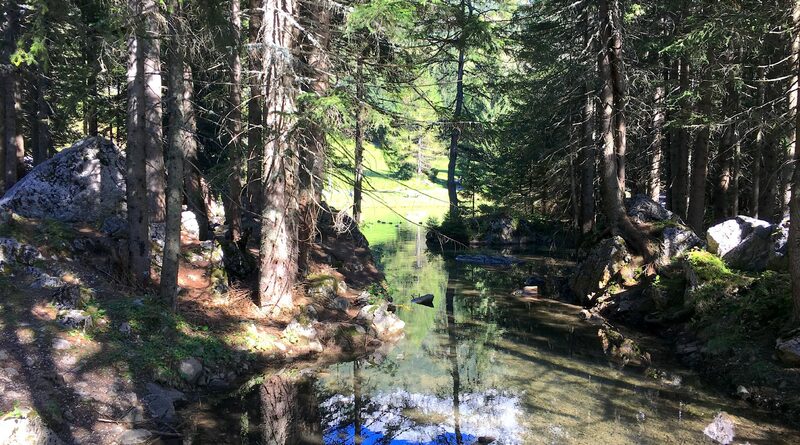 Be it as a place to rest on the path up to the alpine lake or as a place of tranquillity where you can leave your everyday life behind and balance your body, soul and spirit. Reason enough to unpack the hiking boots to visit this special place. 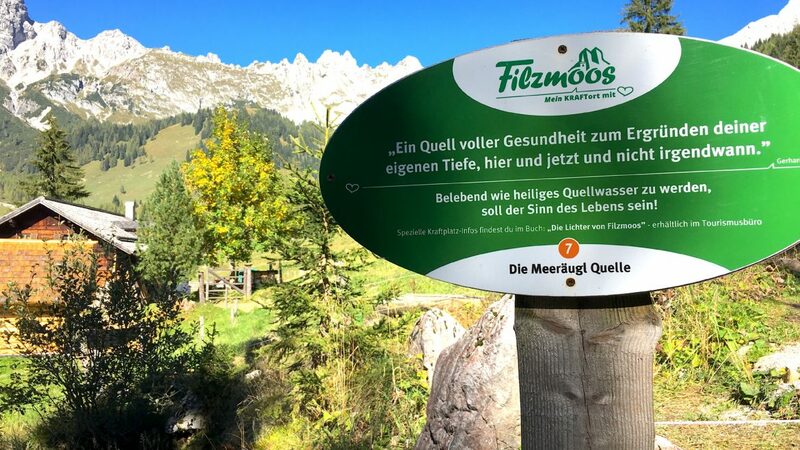 What a picturesque and imposing place this Filzmoos in the Salzburger Sportwelt is?! Embellished houses, the Mandling river flows to the Salzach and the striking Bischofsmütze shines in competition with the equally impressive Gosaukamm in the morning sun. I find it difficult to pull myself away from this view, but I want to reach the top of the Oberhofalm in time for lunch. So, putting on the hiking boots and off we go. The start is at the bus parking lot, down in the valley. From there, a turn left towards Hofalmen, then past the toll station. As I wander steadily uphill, the sun shines its first warming rays upon me and I inhale the wonderful mountain air. I start thinking again of the two shepherds from the legend. Quite eerie, when words suddenly come out of the depths; at least it’s what I think. The shepherds, however, were not afraid of the warning, and rushed to Filzmoos to get the longest of all yarn spools from the local weaver. “The old stories are no longer up to date, we are not afraid to be pulled into the depths if we try to determine the distance from the surface to the ground of the Meeräugl spring,” they gloated aloud and disregarded all warnings. Among the rural population, the belief was that the source had in fact no ground and was connected to the sea. The name that is still most common today is based on these beliefs. The two shepherds tied a heavy stone to the end of the thread and lowered it down into the abyss. As more and more of the yarn was unwound, their anxiety grew. As it sounded once again from the spring, “If thou wouldst fathom me, I will devour thee,” they dropped everything and ran away screaming. Since then no one has tried to find out the depth of the Meeräugl spring. I head on through the really beautiful alpine pastures above Filzmoos past beautiful huts and again along the Mandling creek, which springs from up above the Almsee. ‘At the fork, take the road to the right towards Oberhofalm to reach the place of power,’ says my guide book. So I take the right and walk along the gravel road. The wording “place of power” remains with me and I have to think of what I read last night about Filzmoos. There is a particularly high density of such places of power around here, 16 to be precise. There is the black puddle, the magical chair circle, the cleansing place in the Hachauer forest, only to mention a few. Each one is unique and certainly worth a visit. Suddenly it is in front of me, the first goal of my hike, the Meeräugl spring. It is a wonderfully idyllic and captivating place that affects you through its unobtrusive beauty. Even though a bench invites me to take a rest, I decide to sit on a stone right next to the water. I take off my shoes and let my feet dangle into the water. A few metres above is the actual spring, from which a sizeable quantity of cool water flows to daylight. Several watercourses submerge the whole place and form a wonderful, natural biotope for countless plants and animals. I sit on my stone and watch the water flow. This has something meditative. The definition as a place of power fits here perfectly. 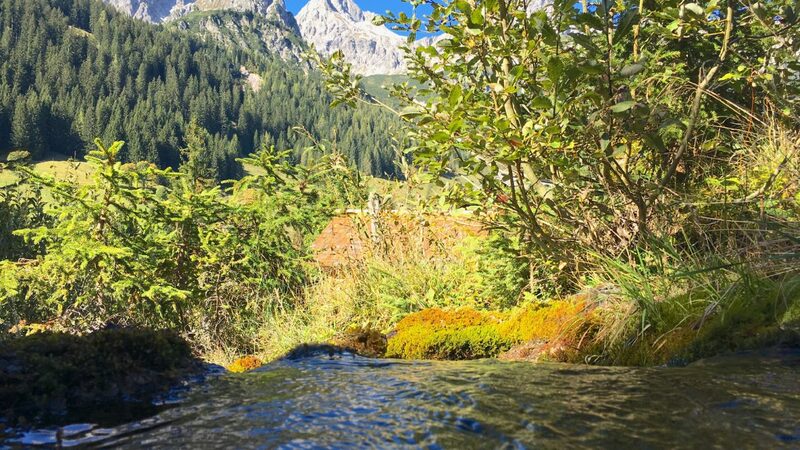 After about half an hour at the spring, wading barefoot through the water and a small refreshment in the form of a cereal bar, I continue on my path up to Oberhofalm. It is now really not much further and after just a few more bends I can see it before me. After a very good lunch on the large Sonnenterrasse, I now want to visit the Almsee lake. It is supposed to be quite unique. Almost like from another world. I am already bursting with curiosity. First a short path over a meadow above the pastures, then I go through some woods and there it is. 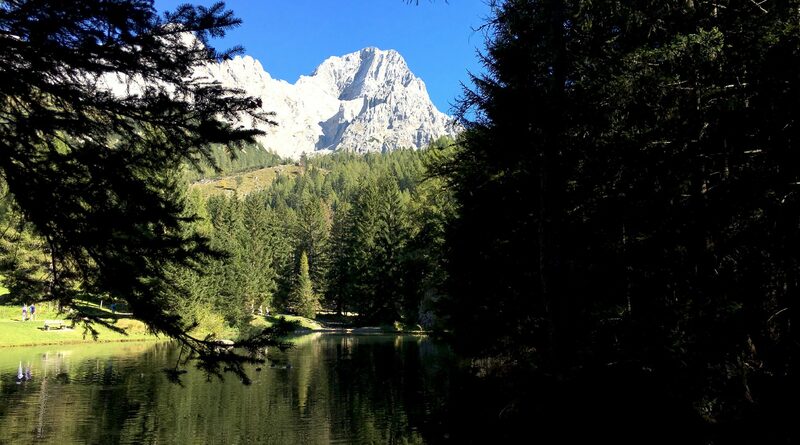 The Bischofsmütze and the Gosaukamm ranges are gorgeously reflected in the calm water, the birds chirping their ever-recurring song and suddenly I notice how I start smiling. Can such a place exist in reality? Like it just popped out of a painting? Only more intense and magnificent. Slowly I walk around the lake, visit the wedding square and the place of gratitude, the two places of power up here at the lake, and I feel glad that I can be in such a beautiful place. 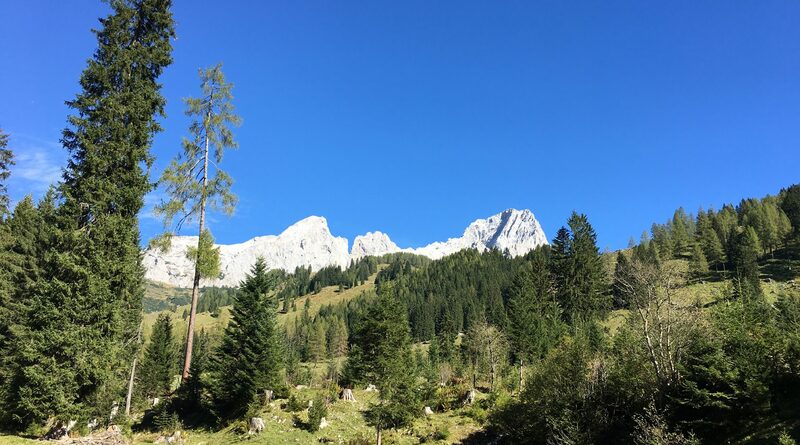 Again and again I raise my view up to the mountains and realise why the Gosaukamm is part of the world heritage site Hallstatt-Dachstein / Salzkammergut. Truly impressive. ©SalzburgerLand Tourismus – Peter Zeitlhofer – Can one ever have too much of here?